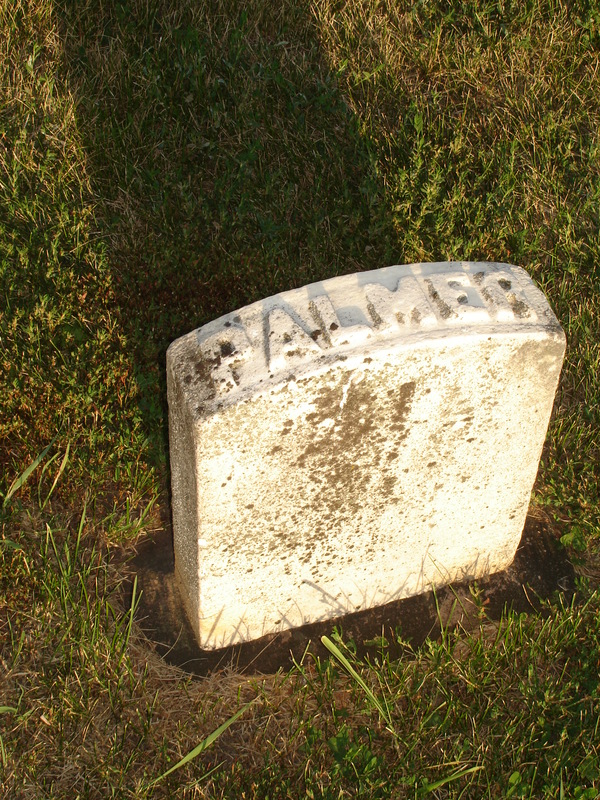 Maud’s grandfather, Solomon B. Palmer, was a veteran of the Civil War. Undoubtedly the Boy in Blue Civil War monument in Lincoln Park brought back memories of her father to Stella Hart, memories that she would share with her children, Kathleen, Maud and Helen. Solomon B. Palmer was born in 1836 in the state of Maine. In 1860 he married Albertine Crocker in Otto, Pennsylvania. Solomon and Albertine were living in Troy, Indiana when he enlisted in the Civil War on February 4, 1864. He was mustered in on April 2, 1864 and served as a private in Company L in the 13th Indiana Cavalry. He was mustered out on May 30, 1865. Two children were born to Solomon and Albertine while they were living in Indiana, Frank and Stella. The family moved to Minnesota and arrived in Winnebago City, Faribault County on May 25, 1870. Solomon died of consumption on June 6, 1875 at the young age of 39 years. He’s buried in Hillside Cemetery, a small cemetery just outside the village of Winnebago. The “Boy in Blue” Civil War memorial and fountain in Lincoln Park where Maud and her friends (famously known as Betsy, Tacy, and Tib) once played, is being rebuilt. On Monday, May 6th, work began on Phase One of the project, which includes the groundwork, infrastructure and ground level pool. I watched with excitement as the backhoe reached down and unearthed the side of the original memorial base and foundation. Within seconds the stone foundation that had been laid 100 years ago could be seen. 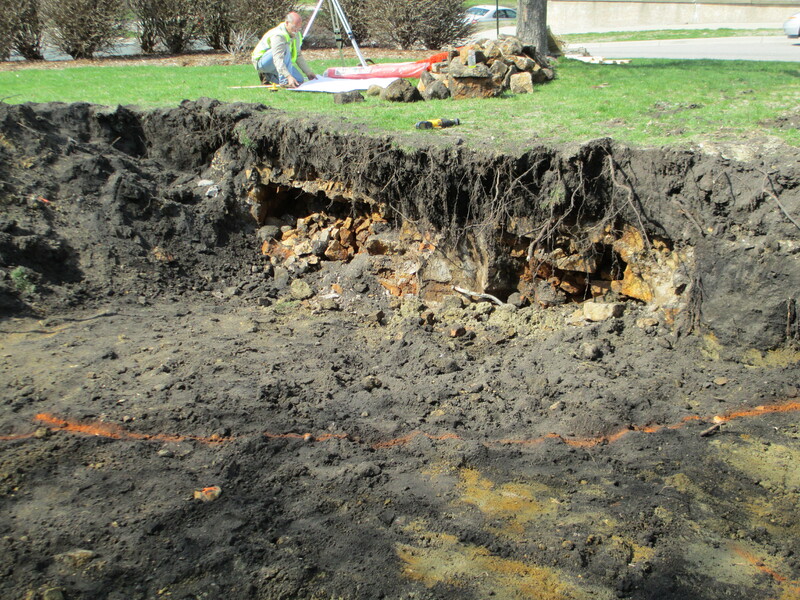 Also exposed was the water pipe that was in the center of the old fountain. Beside the foundation was a circular brick housing that remained standing in what appeared to be perfect condition, buried for all these years. The housing surrounded the original water supply line that fed the fountain, and the pipe and faucet were still inside. 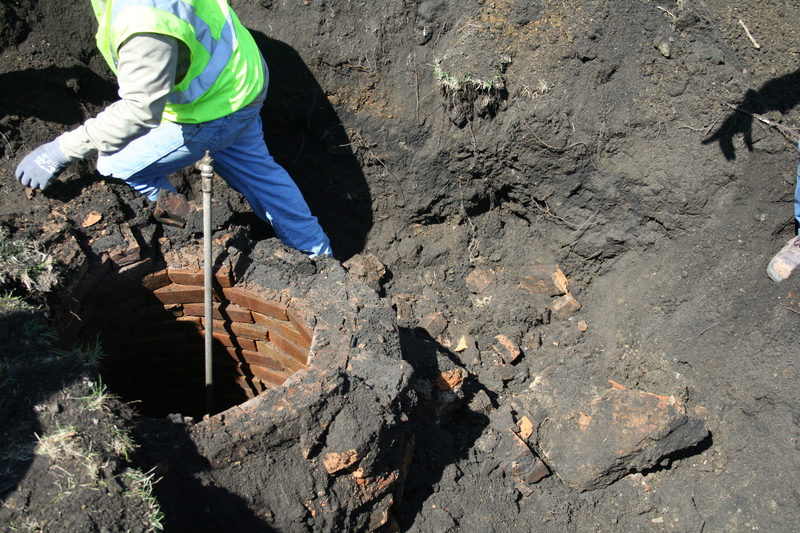 The brick housing was covered with an iron manhole cover. The only other artifacts retrieved from the site were a few small broken, white pieces of a stoneware plate and an old Cony Lantern lid. In a matter of a couple of hours the hole for the new foundation had been dug. I can’t help but wonder how long it must have taken for them to excavate this site in 1892. One third of the funds needed have been raised, enough to begin this first phase of the new memorial, which will be a replica of the original built in 1892 (the year Maud was born). The final two phases will be completed as funds are raised. Donations are currently being sought and more information can be found at www.boyinblue.org. Pictures can be found on the Boy in Blue Project Facebook page, www.facebook.com/BoyinBlueProject, so you can follow the progress. It was Alice who won the Essay Contest in 1910 while Maud Hart took second place. 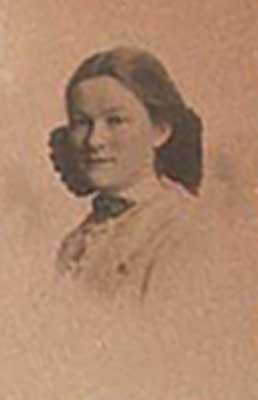 After high school, Alice attended Mankato Normal School and then worked as a proofreader at the Mankato Free Press for two years before she married Andrew Lynch in January 1914. They lived on farms near Franklin, Minnesota and Watertown, South Dakota. The couple had 11 children. Alice died of pneumonia in February 1933, only weeks after the birth of her last child. Alice’s granddaughter Maureen stated “Alice was said to have aspirations that all her children attend college, and many of them did get a college degree (especially the boys who attended via the GI bill after serving in WWII). Maud didn’t use Alice as a character when she wrote the Betsy-Tacy books and it’s not known if she was one of Maud’s “crowd” of friends. An article, “Minnesota Writers – Maud Hart Lovelace” written by Alice Alworth Lynch and published in the Minnesota Journal of Education, Nov 1932 gives some insight into their relationship. The article was published just three months before Alice passed away. “When one has known a celebrity in her youth, it is a great temptation to be saying “I knew her when —, ‘a wish, as it were, to shine in reflected glory if one cannot shine for oneself. 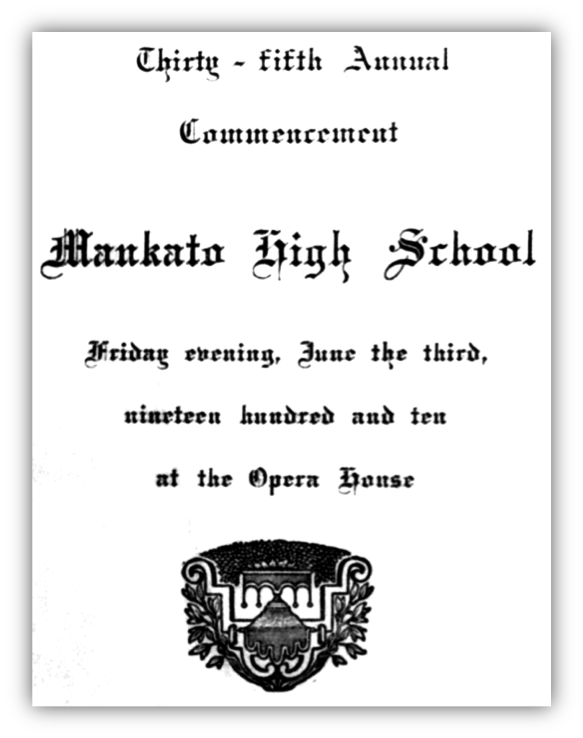 Many of the girls who attended Mankato Normal in the years 1906-1910 must have known Maud Hart. She lived on the corner across the street from the school, and they passed her house every day. Her father, a genial man, was county auditor at the time. She was graduated from Mankato High School in 1910, and while the teachers may have recognized her talent, I am sure we, her classmates, did not. We simply took her cleverness for granted. I doubt if even her family recognized her possibilities. Her older sister, Kathleen, was developing a lovely voice, and Maud was overshadowed. She had to wash the breakfast dishes before school just as the rest of us did, and I surmise that even her imagination was more active than her hands, —otherwise she wouldn’t have been on the verge of tardiness so many times. The subject she chose for her commencement oration, “The Heroines of Shakespeare,” might have given us an insight into her mind if we had not been so busy thinking of ourselves. The years went by, and at various times I heard that she was attending the University of Minnesota—that she was writing short stories—that she had been abroad, and that she married. But it was not until 1925 when I lost a sister who was teaching in Minneapolis that I had any direct word from her. She had just lost her firstborn and was still far from well. We had never been intimate friends, and it had been years since I had seen her. Yet in her own grief she was thoughtful enough to send me a message of sympathy. And therein lies the key to her character. If her friends are legion it is because she knows how to be a friend and to think of others before she thinks of herself. Since there can be no loss without a corresponding gain, it is the heart that has known the touch of sorrow that is most capable of understanding and interpreting the emotions of other human hearts. In these times when the reformer is abroad in the land it is refreshing to find an author who can be lenient with human frailties and who has no wish to show us our faults and weaknesses. Maud Hart Lovelace has rendered this country a distinct service. When it is the fashion to belittle our forefathers and the beginnings of our country, she has had the courage to admire our Colonial forebears, to try to show us the romance of their early struggles and to foster pride in their achievements. These are grievous times for many of us and we need someone to stiffen our backbone so that we may be militant enough to put rout those who would undermine our faith in and our love for our country. Mrs. Lovelace’s books show the painstaking thoroughness with which she works. The backgrounds of her stories are authentic. In preparation for her latest book, a novel of Colonial times, she studied for two years the early history of our country, and read all the colonial newspapers in the New York Public Library from 1752 to 1774. It is unusual to find two careers in the same family. But Maud Hart was fortunate in marrying Delos Lovelace, who is now assistant editor of the New York Sun and himself a writer of note. He could understand and sympathize with her ambitions, and when a woman can say after years of married life “I have the best husband in the world” she is blessed above riches. Success has not spoiled her. She is as simple and unassuming as ever, and she thinks her daughter, Merian Hart Lovelace, born January, 1931, is the most wonderful thing that ever happened to her. In fact she even thinks that raising children is a marvelous career for any woman – which is balm to many of us. While they maintain a home in the East near her husband’s work, her heart is still in Minnesota, where they have a summer home at Minnetonka. Maud always told her fans that the Betsy-Tacy books were fiction based on fact and that she embellished the character of Betsy, making her more interesting and exciting than herself. Examples of this are found throughout all of the Betsy-Tacy books. The following are examples from the final chapters of Betsy and Joe. The fictional subject for the essay contest in Betsy’s senior year was ‘Conservation of Our Natural Resources’. Betsy’s strongest competition was Joe Willard and she expected that he would win. But this time Betsy, a member of the Zetamathians, won the contest. We’re familiar with two of the higher ranking students, as they were friends that Maud used as characters in the Betsy-Tacy books; Harriet Ahlers (Hazel Smith ) and Herman Hayward (Stan Moore). But who is Alice Alworth – the winner of the Essay Contest in 1910? I’ll write more about her later.